Holler & Squall on Atlantic Ave.
Utter South Brooklyn Post. See What Happens. Turn drawings into shirts, bags, keepsakes. Rag and Bone on Court St.
Visit Shen for South Brooklyn Post discount. Sculpt perfect brows for the holidays. It’s easy. Every Sat. and Sun. to Mar. 27, 10 a.m. to 6 p.m.: It’s a little crowded and overwhelming for me, but the Brooklyn Flea is a must-do experience for locals, if for no other reason than to say you’ve been. Last year, it was the Bell of the Media Ball, we’ll see if it gets as much press this year. If you are a bargain hunter, or if you are looking for something special, you’ll find that one of a kind thing here, from paintings to vintage clothes and shoes to toys to mirrors and house wares.. lamps, on and on. If nothing else, walk around, check out the cool people, and eat from the wide selection of food vendors. Skylight One Hanson, 10 a.m. – 6 p.m. The winter market features 100+ vendors on 3 floors, including the bank’s former vault on the lower level. Click here for a map and directions to the location. 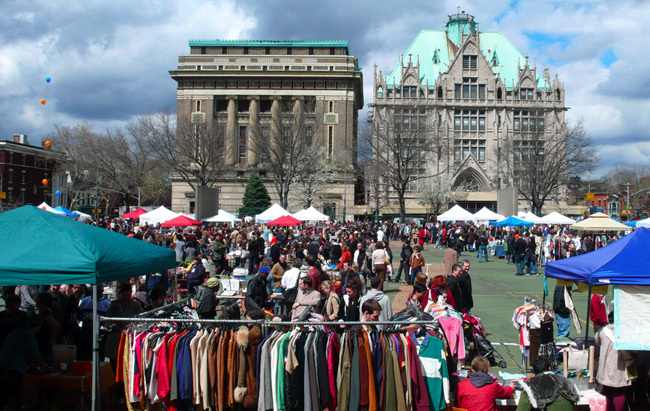 The outdoor Fort Greene Saturday market is closed for the season and will reopen the first weekend in April. The Flea will launch a new/second location on Sundays in Williamsburg, on the waterfront at N. 7 St., also in April. A complete list of regular vendors is here. We post the coming weekend’s vendor lineup and layout every Friday at noon. If you are interested in becoming a vendor, please pre-register here. See you at the Flea!